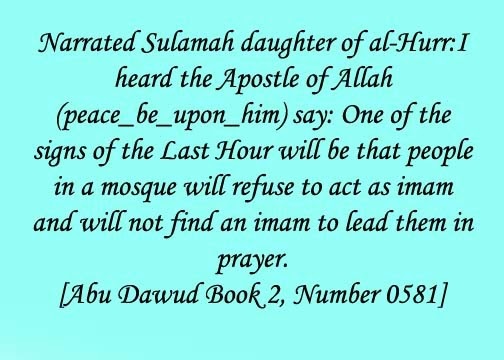 Narrated Sulamah daughter of al-Hurr:I heard the Apostle of Allah (peace_be_upon_him) say: One of the signs of the Last Hour will be that people in a mosque will refuse to act as imam and will not find an imam to lead them in prayer. 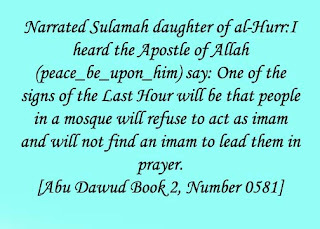 This Hadith explains that as the Hour will approach near people will hesitate to act as an Imam and to lead the prayers. In addition the people will also not find any Imam to lead the prayers for them. This Hadith might also be indicating towards the time where there will be religious ignorance and prevalence of death of scholars thus it will harder to find an Imam.